Power Pusher’s T-45 Rail Mover ™ industrial electric tug enables a single person to safely move 45 tons reducing the challenge of moving massive railcars. The flexible mover operates on or off the rails for increased dexterity and efficiency allowing for easy maintenance of rolling stock. Remote control operation is available as infrared or radio control for easy maneuvering. 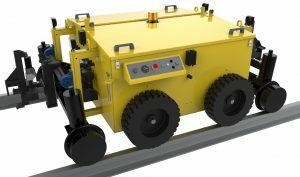 Powered hitch connects and disconnects to rail cars via remote control for easy contact and performance. Work with design engineers to customize the rail mover to your company’s unique needs.